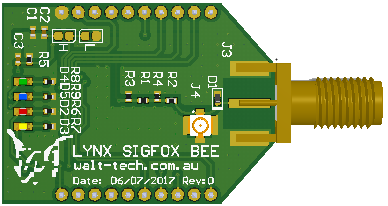 Sigfox BEE sized LP-WAN module, with a popular footprint based on Digi’s XBee module form-factor. ~20Km range. Very low power devices for long battery life. RCZ1 zone with u.FL or RP-SMA connector. LP-WAN module targeted for Sigfox’s global IoT network. Seamless roaming across multiple geographies. Popular footprint based on Digi’s XBee module form-factor. Small form-factor - ideal for embedded systems or sensors. Low power consumption - for longer battery life applications. Low cost - lower cost of ownership (lower capex & opex). Ease of development. Ease of deployment. Ease of Support. Parking & Traffic Management (road magnetic sensors). Waste Management (waste bin level monitoring). Smart Lighting (remote sensing and basic control). Smart Industry or Industrial Applications. Utilities (Water, Electricity & Gas - metering). Product status is in production.